Feel free to hyjack the post to update it. Last edited by Ryukai on May 10th, 2012, 7:52 pm, edited 8 times in total. I just got home for the weekend, and I am dying to go find a Marshfiddler! Add Sifang Otter and Sifang Otter Pup to Krasarang. And the only two that I noticed in The Hidden Path was Shy Bandicoot / Shy Bandicoot Kit and Softshell Snapling. Still have to do a little searching over near the horde starting area, but other than that, I think I have them all. Couldn't find the Bucktooth Flapper to take a screeie, I did notice some phasing going on with critter's vanishing before my eyes. They have finally fixed the jade witch quest so I'll try finish the zone off tonight. 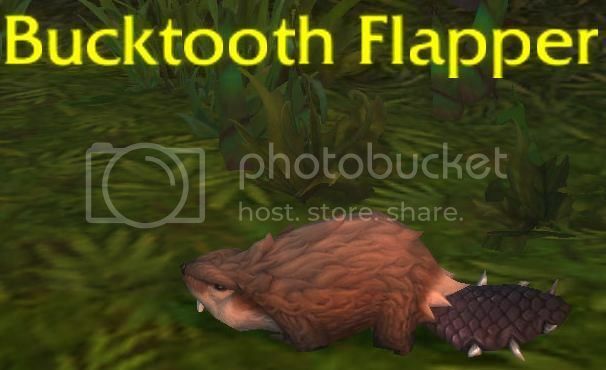 Just noticed that the Bucktooth Flappers come in both a light brown and a dark brown (not sure how this applies when they're captured). In addition, the Spotted Bell Frog come in a green and a blue model. Also, there are now Jumping Spiders in Jade Forest and the Blossomtail has been changed from a squirrel to a raccoon (and a Blossomtail Kit was added)! Add Leopard Tree Frog to Jade Forest, level 23, presumably aquatic, may be tamable later as it is labeled "Wild Pet" and I can't initiate a battle with it. None of them were valid battle targets - maybe they will be tamable or they just hadn't classified them yet. Shy Bandicoons appear to be tamable in the Valley of the Four Winds now. They do not have the icon on the map, but they do have the tamable cursor and they show up in the pet journal. Last edited by Duerma on May 8th, 2012, 11:25 pm, edited 2 times in total. Pet battling is still enabled - you can still initiate a battle. For me at least, though, my client's crashed on the first turn of a battle. The pets do still have levels; once you initiate a battle with a creature you will see its level. It's just not on the tooltip anymore. Grove Viper's was now tracking as a tamable pet, and it is lvl 1.